If you’ve ever wondered what would possess someone to spend several years of their life writing a large, unwieldy manuscript that may or may not lead directly to gainful employment, you are not alone. I’m certainly not able to answer that question in general, but for me it was a combination of nerdiness, passion, and determination combined with a mild dose of masochism. Not to mention very supportive and overly-educated parents. That and the realization that I could combine two things I love into one very large Word file: dress history and bicycles. 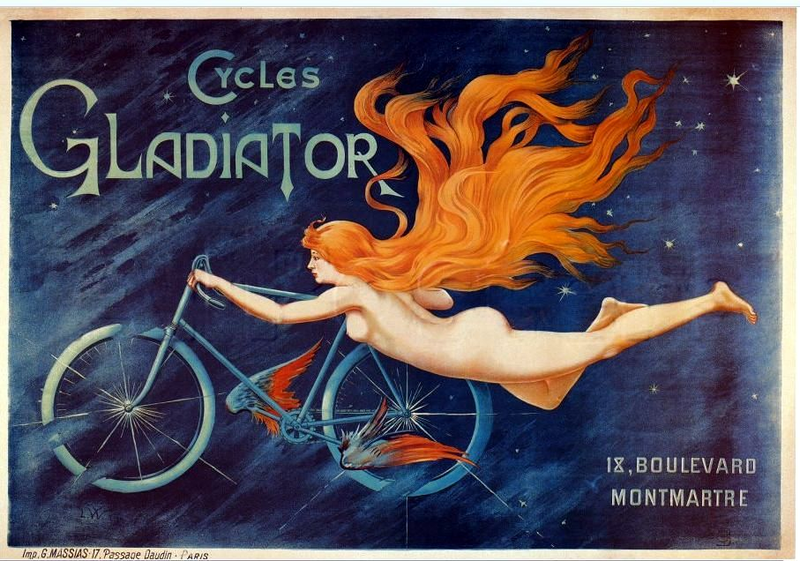 The bicycle often has been linked to ideas about liberating women. 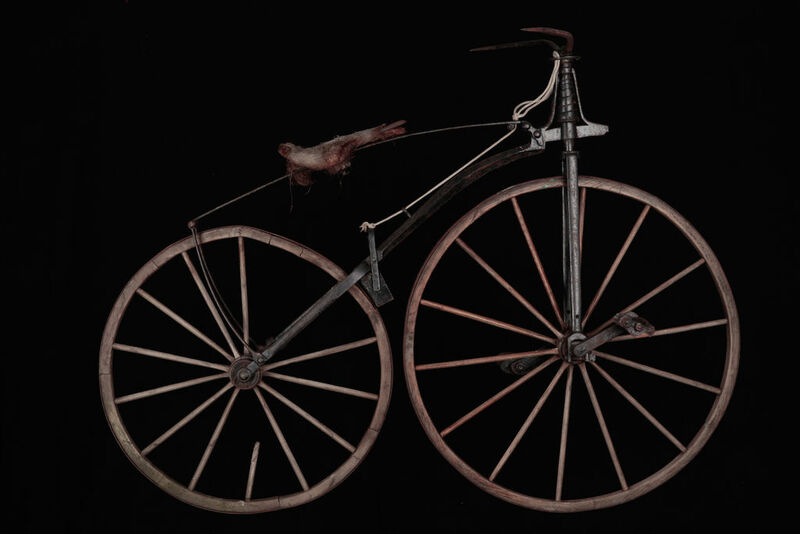 Susan B. Anthony famously said: “Let me tell you what I think of bicycling. I think it has done more to emancipate women than anything else in the world. It gives women a feeling of freedom and self-reliance. 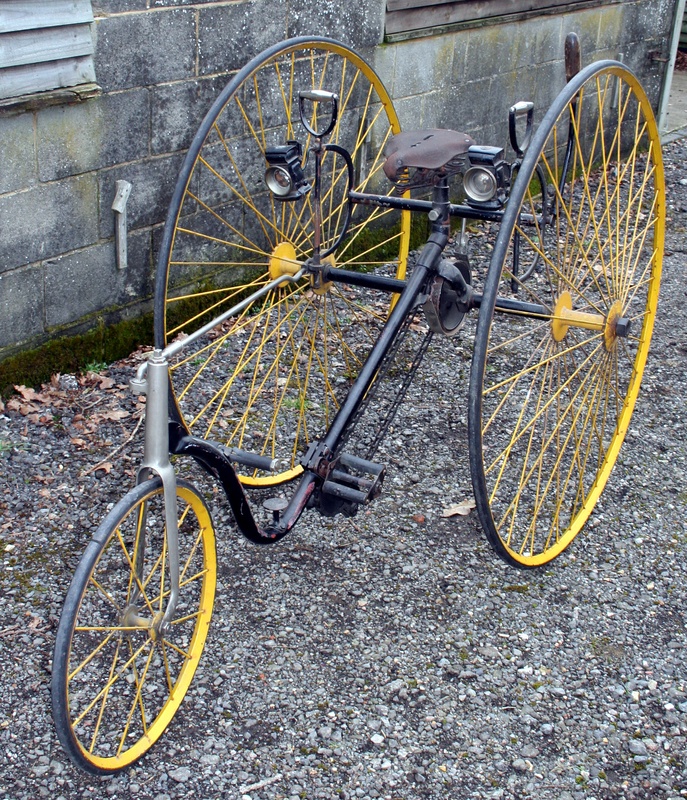 I stand and rejoice every time I see a woman ride by on a wheel…the picture of free, untrammeled womanhood.” While bicycling did not really transform the women’s movement, for women living in the late nineteenth-century, bicycling made it much easier to move through the world relatively unencumbered. Horses were very costly to own and maintain. 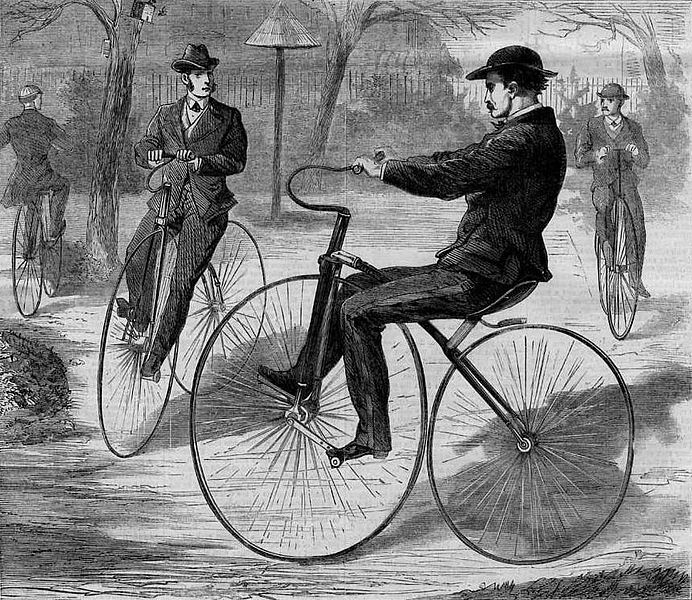 Early bicycles were also expensive, but they became much more affordable by the mid-1890s, opening up cycling to multiple classes of women. There is still something magical about getting on a bicycle and flying off down the road, regardless of one’s gender identity. Imagine how it might have felt to a woman who lived in a world without many transportation choices, where gender roles for women were far more restrictive than they are today. 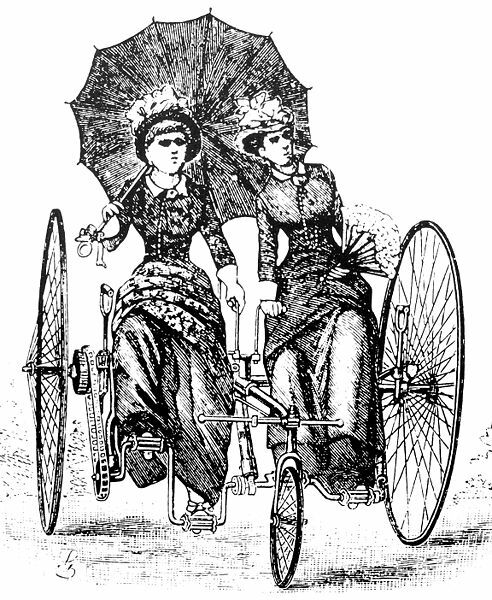 Women had to find ways to define bicycling as an acceptable activity for a “lady.” They had to learn how to ride, figure out what to wear, and some had to convince their fathers or husbands that bicycling was a reasonable activity. 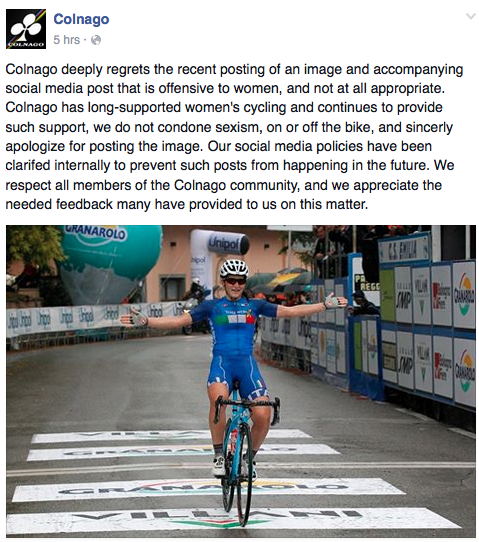 Considering bicycling clothing was necessary for practical reasons (how do you ride in a skirt? ), but clothing was also a language that most women spoke. Linking it to bicycling made bicycling seem more accessible. 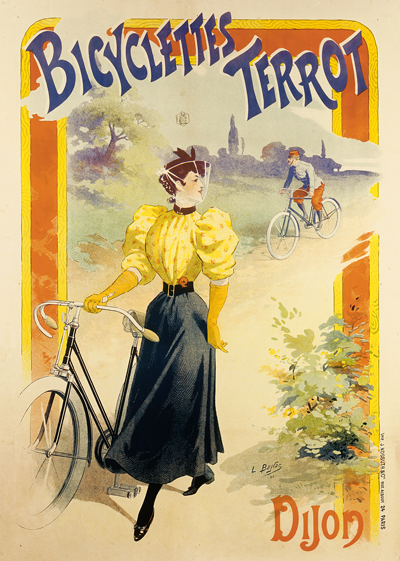 Which brings me to why on earth I would want to write about bicycles and dress. I’ve always been interested in clothing, and in high school I took three years of intensive sewing. Really. I stayed after school and sewed. I sometimes came in on weekends and sewed. Basically, along with piles of novels, sewing was my salvation. I did not have raw talent for sewing, but I do have stubbornness on my side, so I figured it out eventually. Later, I figured out I could combine books and clothing by studying dress history, so off I went to grad school. 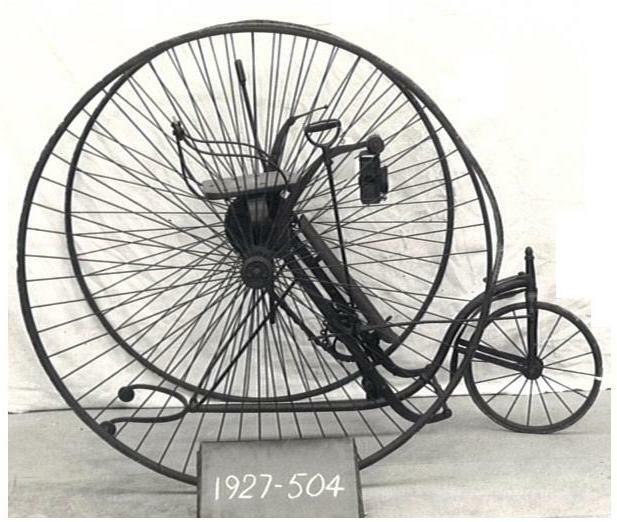 Bicycles were a somewhat more challenging progression. Both of my parents used bicycles to get around as kids. I did not. 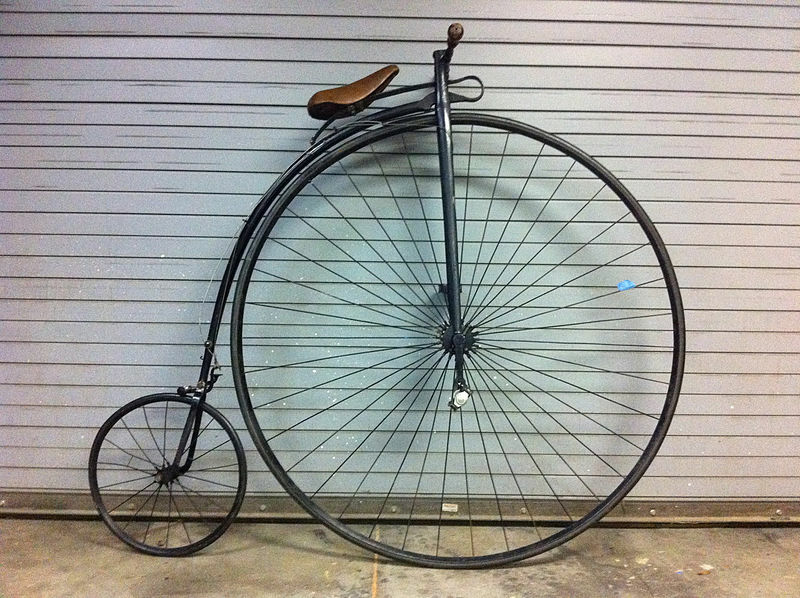 Not because my parents wouldn’t let me, but because I had a strong aversion to that wobbly two-wheeled object. Eventually, I figured out bicycling and came to enjoy it, but I regretfully never biked in college in Chicago. 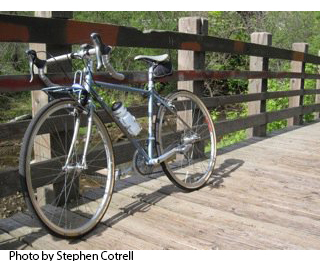 After I moved here, it took me a while to become accustomed to biking in the Twin Cities. But then I fell in love. First with a bike mechanic (quickly rendered irrelevant) and more importantly with bicycling itself. After the former romance with soured, I decided I was going to invest in a nice bike and get into more serious cycling on my own. So, I bought a Salsa Casseroll, pictured above. Learning to really ride a bicycle– as opposed to casual rides on a hybrid– was a steep learning curve. Thanks to one crash, my chin is no longer symmetrical, but the early crashes were a small price to pay to finding such a liberating activity. Why did I find cycling so liberating? Cycling made me much more confident. I was never especially athletic when I was growing up, so it was transformative to find a physical activity I liked. I loved that I could go on a ride by myself whenever I wanted, but that I could also explore the city by bike with others. 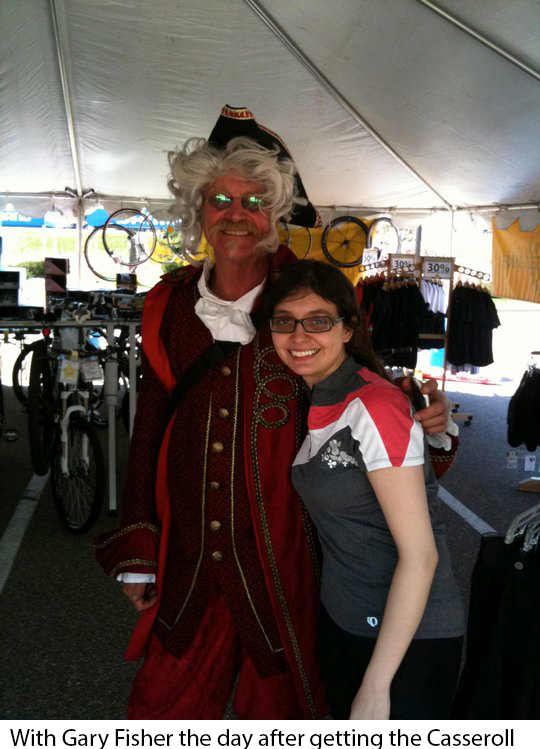 I’ve met many people through cycling I never would have met otherwise (I also met my husband because of bicycling, but that is a story for another time). I became much more familiar with the cities by bike than I ever would have by car. Bicycling also served as an activity other than reading in which I could remain in my typical hunched-over position. What do you find liberating about biking? 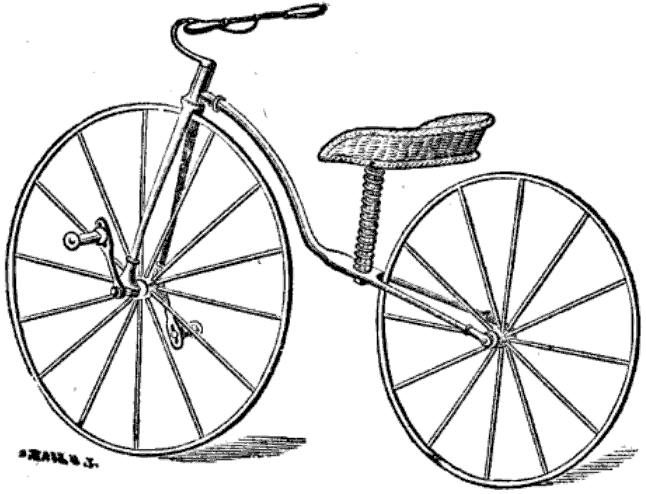 Eventually, I realized that my focus on dress history– namely satire in the 1890s, could easily be linked to bicycles. Popular satirical magazines like the British Punch and the American Puck often made fun of women’s fashions. The trope of the New Woman, or early feminists who reportedly adopted masculine habits and dress, became a frequent target. 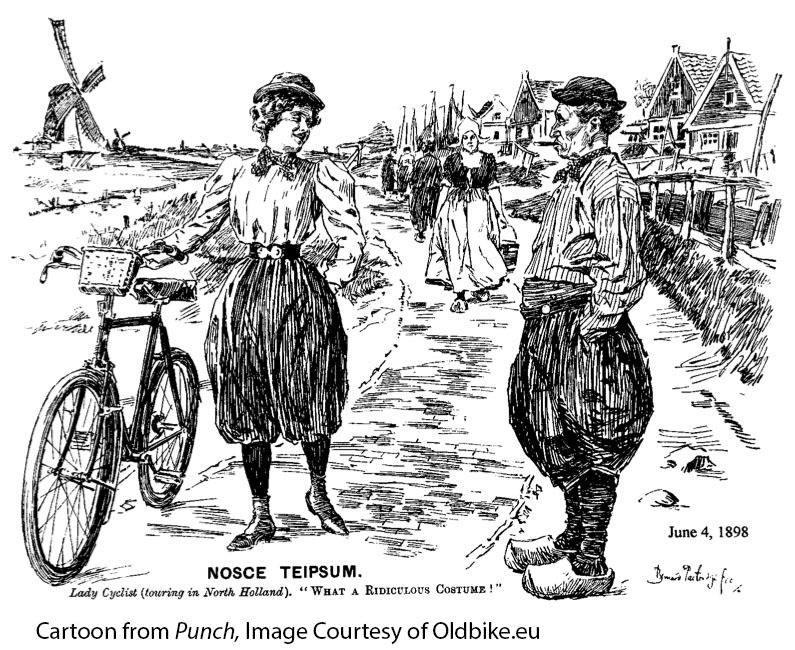 Cartoonists often depicted the New Woman wearing bloomers and riding a bicycle, an image that endures to this day when people think of women bicycling in the 1890s. Yet, I discovered that most women rode in skirts. So, why did this image occur again and again? 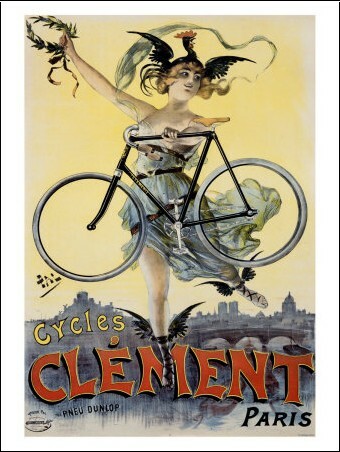 My topic was spurred on by a random conversation with someone who recommended that I look at bicycling posters. While my main focus ended up on neither satire nor posters, my early research for class papers combined with one random conversation sparked the beginning of this very long path.